The move to eliminate the November Nine was seen as an inevitability once the WSOP went to the live broadcast (or nearly live as the case may be) of the final table of the World Series of Poker Main Event this past year. A move which I must admit I have been clamoring for since I first heard of the idea. 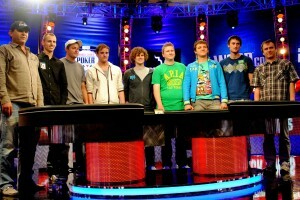 The original intention of the November Nine format (where players went on a prolonged hiatus once the final table of the WSOP Main Event was decided) was to allow poker fans to watch the WSOP winner be crowned before they knew who the actual winner was—something that proved untenable even with just one-day in-between the even being aired on ESPN—as well as giving ESPN a chance to market the final table properly. However, once the WSOP and ESPN decided to show the final table on a fifteen minute delay, expanding the final table coverage to show every single hand, the November Nine concept became as obsolete as a portable CD player. For poker purists the November Nine was always seen as an abortion of tournament poker, since it allowed players to catch their breath and think back on the momentous accomplishment making the WSOP final table is; study their opponents; hire the very best poker coaches; secure lucrative sponsorship deals; as well as simply changing the overall dynamics of the game since players viewed as “running-good” lose that reputation during the long break. For poker fans the possibility of making it even a single day without seeing who the winner of the WSOP was proved near impossible, short of disconnecting from the Internet for 24-hours. With Yahoo, MSN, and Google displaying articles on the WSOP winner across their front page, Google Alerts hitting players E-Mails, or even simply avoiding a random Tweet or Facebook post proved nearly impossible. While the November Nine idea was good in theory, it failed to live up to its expectations in practice, even when the WSOP and ESPN were fortunate enough to have Phil Ivey at the 2009 WSOP Main Event final table, something that failed to have the expected impact on the ratings for ESPN. Furthering the problem for the November Nine concept was the rise of Social Media at the same time, bringing information from the Internet to its users even faster than before. We’ll have to wait and see what the additional tournament tweaks and scheduling changes will be until tomorrow, which will likely come in the form of an official press release from the World Series of Poker. This entry was posted on Tuesday, January 31st, 2012 at 8:52 pm and is filed under Poker News. You can follow any responses to this entry through the RSS 2.0 feed. You can leave a response, or trackback from your own site.